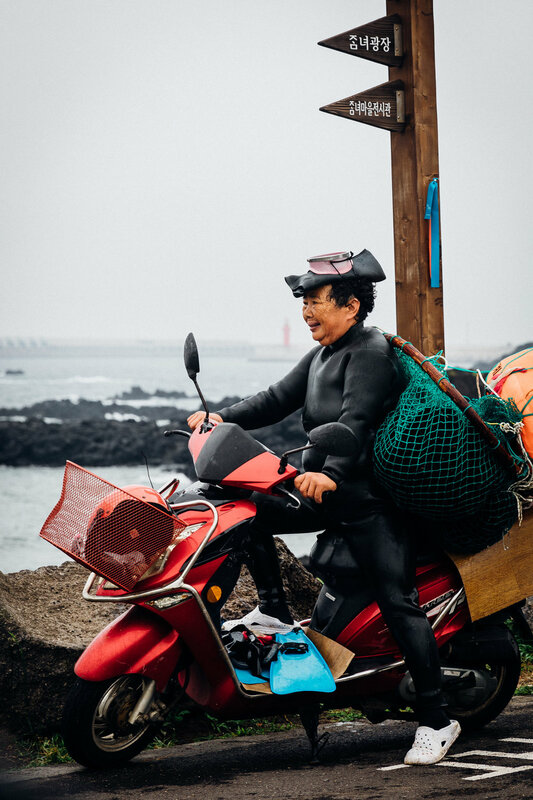 When I was growing up, I had heard about the legendary sea women of Jeju Island, known as the haenyo. 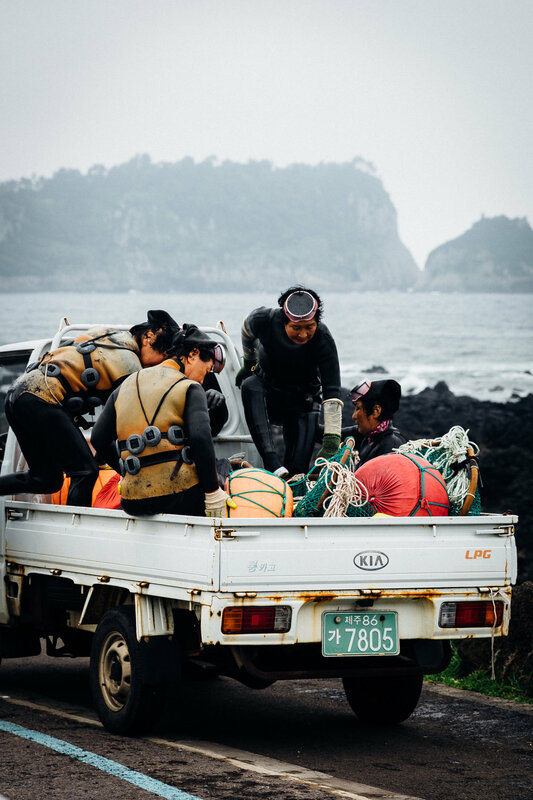 The haenyo are women who have been the primary breadwinners of their households for generations, supporting their husbands and families by free diving for seafood. Free diving, as in plunging to the depths of the sea without any breathing equipment, and until recently, without wetsuits. 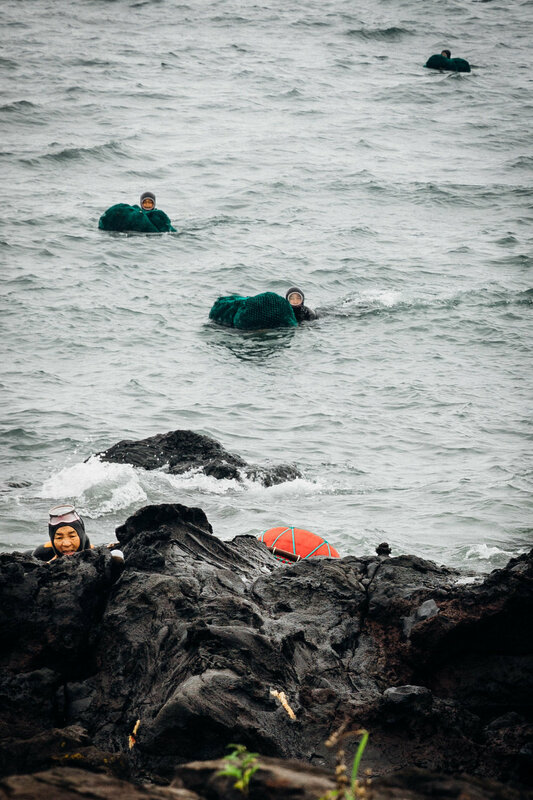 In any culture, women like the haenyo of Jeju Island would be extraordinary. In a still patriarchial Korean society, these women are miracles. 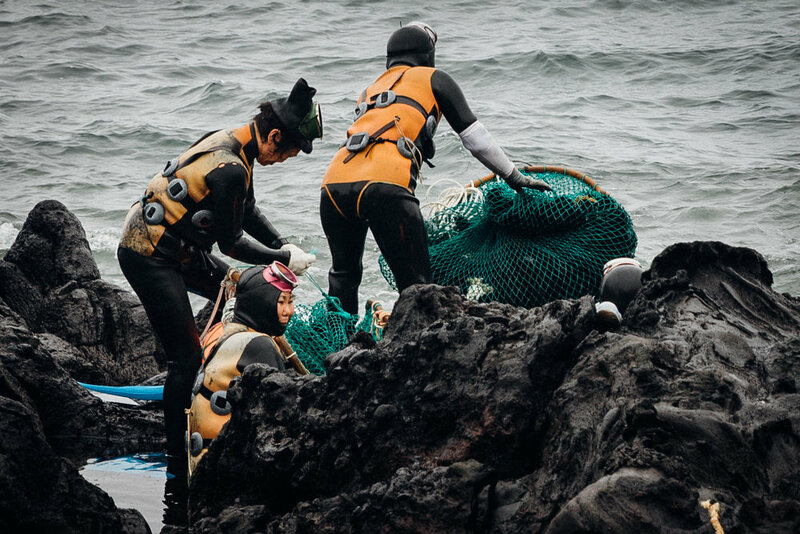 Since the 17th century, women on Jeju Island have been diving in search of abalone, sea urchins, oysters and other treasures. They typically start their haenyo training from 11 years of age, and today, almost all of the haenyo are over 50 years old. The majority of haenyo today are in their 70s and 80s and still strapping on their green nets to their backs and going out to sea. In my mind, the haenyo have been as mythical as mermaids. I imagined Jeju Island as a real-life Wonder Woman island, wild and covered by ancient forests, where women ruled without threat of subjugation, gender bias, or mansplaining. I imagined an island where women were truly free. Free of traditional gender roles. Free to speak their mind. They are just free to be themselves, and even (gasp!) celebrated for it. On my recent trip to Jeju, I was lucky enough to see and meet not one, but two, bands of haenyo. One morning, my boyfriend and I were having a feast of a breakfast of abalone kimbap and abalone porridge from the renowned Kim Man Bok. We sat by rocks lining the ocean, looking out onto the sea. It was a spectacular view, abalone has a special place in my heart since it was my mother’s favourite food, and I was sharing this moment with my love, so I was already feeling lucky just to be there. Then, we spotted green nets bobbing in the water in front of us. Then there were shiny black heads popping up and then disappearing, but clearly coming closer. I might as well have been eight years old and thought I saw Wonder Woman’s white horse galloping towards me. I may have shrieked in delight. You’ll have to ask my boyfriend who I was shouting at to follow me as I threw down my porridge and scrambled down the rocks to the water’s edge. One by one, the haenyo emerged from the water. Their green nets were heaving with their loot. Soon, a collection of haenyo were perched on the rocks, gathering their ropes and nets. Some rested for a moment, tired. I thought of my grandmothers and the elderly women and men in my life. I thought of the young women and men in life, for goodness’ sake. Could I imagine going out every morning free diving in these icy waters at my age, or any age, much less in my 70s or 80s? Up close, you can see the lines in their faces burnished by decades of sun and salt. Their voices, speaking in their local dialect, are warm but lined with an undercurrent of steel. How much strength would they have required over the years to simply exist as themselves in Korea? You could see their camaraderie, a probable result of their unique place in society. For more than 60-70 years, these women in front of me have been part of the most badass squad I could imagine. Shortly after landing on shore, this OG squad was picked up in an open pick-up truck, and most jumped into the back. One grandmotherly haenyo stayed behind, tying her net to a scooter. She quickly hopped on, adjusted the mirrors and then sped away. After we watched the haenyo ride off into the distance, we were in a daze at our good fortune. We drove around and ended up at one of the many haenyo jip, or haenyo restaurants dotting Jeju Island. (Yes, it’s totally normal for us to eat breakfast and then basically go straight to lunch.) These restaurants specialise in serving dishes made from the fresh seafood caught by haenyo. When we arrived at the restaurant, we saw yet another band of haenyo were climbing out of the ocean to directly drop off their catch at the restaurant. I ran up to the haenyo and followed them around like the groupie that I was. In sheds outside the restaurant, the haenyo washed off, changed and rested before going about their day. Another group of women sat down in a separate shed with a pile of sea urchins, opening and gutting them to be served. Some people dream of rooms filled with gold. I dream of rooms filled with sea urchins. Lunch was simple and glorious. We started with a bowl of mul hoe, which is a melange of fresh sashimi in a chilled spicy broth. Our bowl heaved with sea squirt, sea cucumber, sea whelks, seaweed and julienned cucumbers, and was topped with a mound of sea urchin. This collection of rare delights was so delicious, I wanted a second bowl. But then our sea urchin kalguksu, or knife-cut noodle soup with sea urchin, came out. At first glance, I was disappointed – where was all of the sea urchin? But then I realised that all of the orange goodness had sunk to the bottom of the bowl and everything was right in the world again. The haenyo are sadly not being replaced by younger generations. For the last 50 years, young women of Jeju Island have moved increasingly into the tourism and other industries or left the island altogether. It seems impossible to imagine Jeju without the haenyo, but that’s a reality in the impending decades. For my future grandchildren, the haenyo of Jeju may very well be as real as Wonder Woman and the Amazons of Themyscira. I hope that when I am a grandmother, I can be a fraction of the badass these women are. In the meantime, I’ll be making many trips to Jeju for more inspiration. Jung Sung Deum Bbuk (Jeju City) – A local, down-home restaurant that was my first stop on this trip to Jeju. Order the battered and fried sardines and the fermented soybean paste soup. They make their own fermented soybean paste which is out of this world. Dongmun Market (Jeju City) – A market with fresh seafood stalls showcasing the unique seafood of Jeju Island. I suggest ordering a mixed sashimi platter from Woo Jung Sashimi Center, one of the vendors at the market (you can’t miss the crowds in front). Also check out Jina Dduk Jib, one vendor at the market that’s famous for their omaegi dduk, a special kind of sweet rice cake that’s a Jeju specialty. Osulloc Tea – One of Korea’s largest tea companies has its plantations and visitor center in Jeju. Their hydrangea bushes are Instagram favourites, so step around the would-be Instagram stars and go straight to the café and order a Korean green tea softserve ice cream and a hallabong slushy (made with hallabong, a native Korean citrus). Their shop sells all of the Osulloc teas and beauty products made from tea. A separate Innisfree shop is also on site. Yudong Coffee (Seogwipo) – The Jeju outpost of this Busan coffeeshop has excellent house roasts and the perfect hipster vibe to start your morning. Kim Man Bok (multiple locations) – My boyfriend said you can find this brand in Seoul’s fanciest department store food halls. But I made him go anyway because it’s always better to have the original, no? And then we saw the haenyo, so the lesson for him is, always listen to me. You don’t have to, but they are known for their abalone kimbap. Baekgi Haenyo Jib (Seogwipo) (88-19, Ilchul-Ro) – Where we saw our second band of haenyo and also had the most divine bowl of mul hoe. Sinsulorum (Jeju City) – A local restaurant specialising in momguk or a soup made with a native seaweed and pork bone broth. The healing properties of this soup, are legendary, as well as the anti-aging effects from the collagen. The seaweed is called mojaban in the rest of Korea (or sargassum or Indian brown seaweed in English), but known as mom in the Jeju dialect. Bonte Museum (Seogwipo) – Designed by Tadao Ando, this museum is one of the few serious art spaces on Jeju. Water Museum and Wind Museum (Seogwipo) – Both designed by Itami Jun, these are striking architectural spaces that are part of the Biotopia luxury resort. Note that you need to book far in advance as there are limited tickets for showing times. All recommendations for my next trip to Jeju welcome!